A convenient location comfy accommodations and complimentary Wi-Fi are welcome amenities for our guests at Marina Inn and Suites. 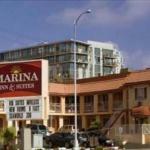 The two-story 29-room Marina Inn and Suites makes up beds with pillowtop mattresses in all of its accommodations. Free Wi-Fi and coffeemakers microwaves and mini-fridges are among the in-room conveniences. There are two-room suites available; these have bunk beds in the second room. Parking is free. The Marina Inn and Suites is one block from the marina just steps from the Maritime Museum of San Diego and less than two miles from San Diego International Airport. Situated at Little Italy's doorstep only two blocks from the Little Italy trolley station the hotel is in a primo location for enjoying a little spaghetti Bolognese and a stroll or for doing some daytime touring via a carbon-footprint-reducing means. The Gaslamp Quarter too is easily reached by public transport for dining and nightlife. By car it's a 10-minute drive to SeaWorld.